It’s a condition that affects the flexor tendons of the thumb and fingers leading to locking or catching before popping out straight. 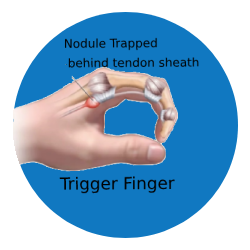 Inflammation of the flexor tendons and its sheath causes thickening and nodule formation leading to difficulty in passage of tendons through the tunnel. Common in women between 40 -60 years of age.